Players must stand together more than ever as The Dark Titan Agranok returns from banishment seeking vengeance. He will lay siege to your Castle with help from new Monsters, such as the Dark Sorceress, Elite Monsters, and a Boom Troll. You get more reinforcements with the Cavalier, Boiling Oil, and Support Tokens, such as the Supply Wagon. Play them wisely and you could save the Castle. But Agranok and his team have many tricks and can overpower you if you don’t stay alert! Gather your forces. The Dark Titan is here! 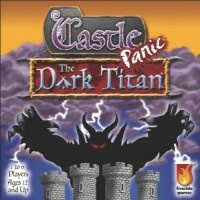 The Dark Titan requires Castle Panic to play. 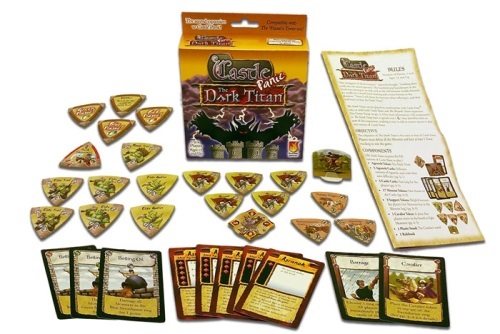 Add a Review for "Castle Panic: The Dark Titan"